The reasons for the damage of the nacelle housing at German Alpha Ventus Offshore Wind Farm which came crashing down last month are still being investigated. Meanwhile, the operator of the wind farm, German utility EWE, is preparing to replace said nacelle. On 6 April, large parts of one of the Adwen AD 5-116 turbines at the German offshore wind farm Alpha Ventus in the North Sea came crashing down, including the roof, sides and floor of the nacelle housing (Windfair reported). Nobody was hurt and no threats to the marine environment were reported, but it is still unclear what caused the incident. For safety reasons, all other wind turbines of the same type are put into standby mode ever since and are blocked for maintenance work. Now, preparations have begun to put a new nacelle into place. Therefore, a Service Operation Vessel (SOV), which is equipped with a hydraulic gangway designed for offshore use, is needed. Specially trained industrial climbers will secure or remove the technical components located outside the machine carrier or drive train housing to prevent falling. The exact time of the repair "depends on the availability of the ships and the weather," Christian Bartsch, spokesperson of EWE, told German media outlet NDR. Subsequently, the sunken parts of the nacelle housing will be recovered from the seabed and the power supply to the wind turbine restored. In the next step, the nacelle and the rotor will be rotated into a position that allows disassembly of the rotor and replacement of the nacelle. The damaged nacelle will then be transported to Adwen in Bremen where the investigations will continue. What's clear at the moment is the retaining bolts of the nacelle frame are broken or torn - but why it happened is currently unknown. Evaluation of the data recorded by the Condition Monitoring System is already in progress. The visual inspections of the other five turbines started last week - when exactly they will be able to resume power production is currently still to be determined. EWE has announced it might be late summer until everything is back in operation. 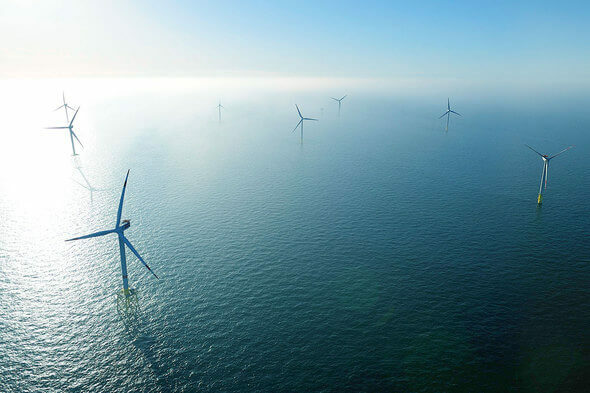 Alpha Ventus is located in the North Sea near the German island of Borkum and is the first German offshore wind farm which began operating in the EEZ back in 2010. The wind farm consits of 12 turbines and is used by EWE, E.ON and Vattenfall for research purposes. GE Renewable Energy and Future Wind have agreed to install the prototype of the Haliade-X 12 MW in Maasvlakte-Rotterdam (NL) during summer 2019.